xDD nehh it was in another forum what i read..."Tekkenzaibatsu: Spanish group"...but thinking about that is not as you said nonsense...maybe its true and not as you said like something unreal or...who knows .___. The blue costume from Tekken 5 was just a bonus costume designed by some...designer...I don't think it's to be taken as canon. The blue costume from t5 was my favorite. No Tekken 6 arcades here as well. Bluh.. Anyway; I love the clip! By the looks of Yoshi's chin, he probably shaves every morning. better then SC4 wooden face =_= alot better. and i just notice something, does he have a flag on is back? Wow Yoshi looks good with Hair. I have dial-up, so loading takes a long time (I miss highspeed :X), but anyhow, I loaded it up, at least the beginning quarter, just so I could see this! Pris: dont worry about the kissing with Yoshi, haha..., maybe someday, you too! 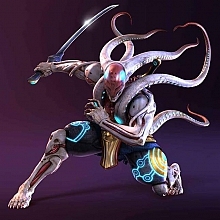 One brother does wish to cosplay Yoshimitsu, and has been plotting how to make one of Yoshi-san's masks... actually, me, and another brother, also wish to cosplay Yoshimitsu; which would be funny if we could do three different Yoshis at once. I`m not sure what Yoshimitsu`s face looks like but in Tekken 2 youn can see the back of his head and he has black hair .In Tekken 1 he has red hair what`s the deal with that! in SC4 part of his face is made out of wood?